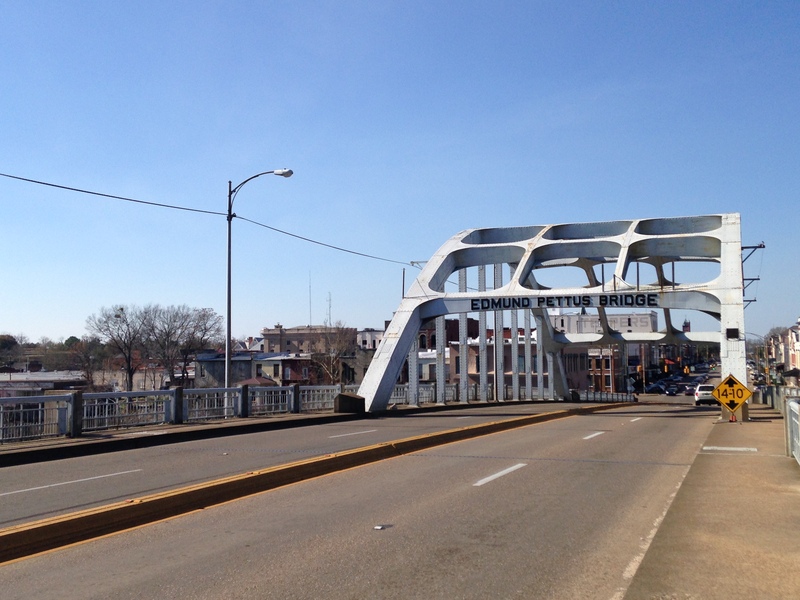 Yes, going from Montgomery to Selma is backwards — the march in 1965 went in the other direction — but this made more sense given what we wanted to see and do today. 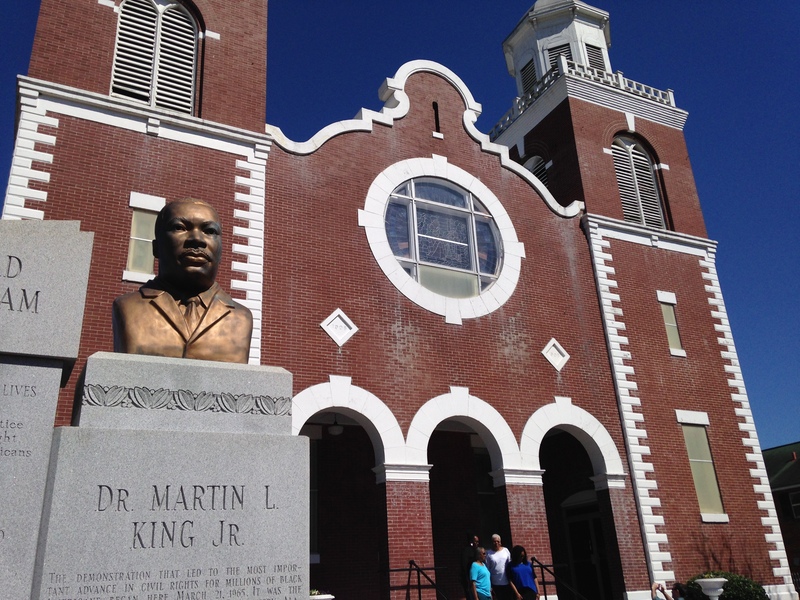 Montgomery has earned the title “birthplace of the Civil Rights Movement” for several reasons: it’s where MLK Jr. got his start as a young pastor; it’s where Rosa Parks famously refused to sit in the colored section of a bus; and it’s the site of the first major protest (the Montgomery Bus Boycott) in the US. It’s also now the home of the Southern Poverty Law Center (SPLC), and organization that works (largely through legal cases) to guarantee civil rights for everyone across the country. 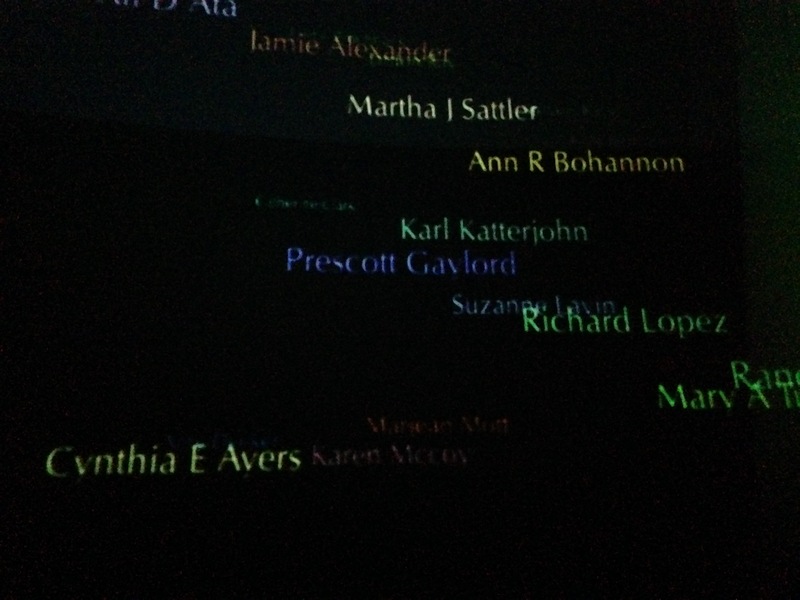 We started out in front of the SPLC, at Maya Lin’s Civil Rights Memorial. 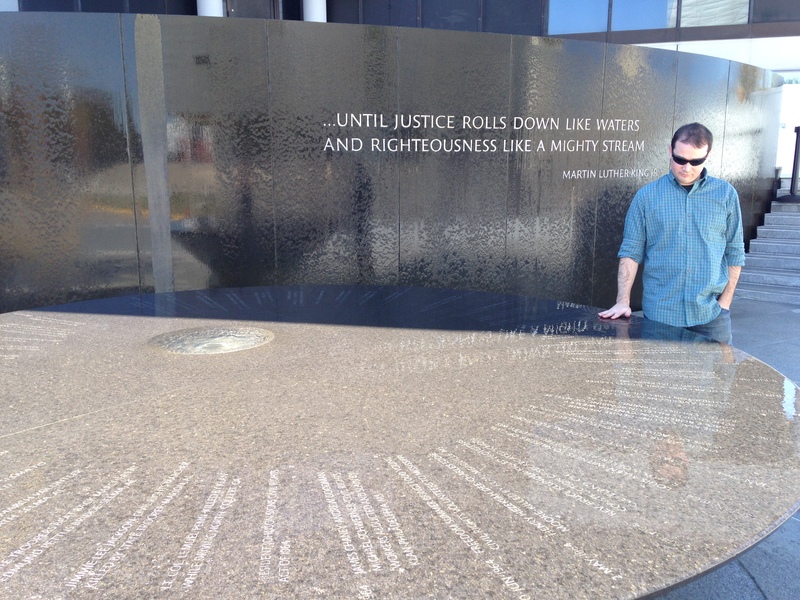 It celebrates at least 40 people who died during the Civil Rights Movement, from 1954-1968. 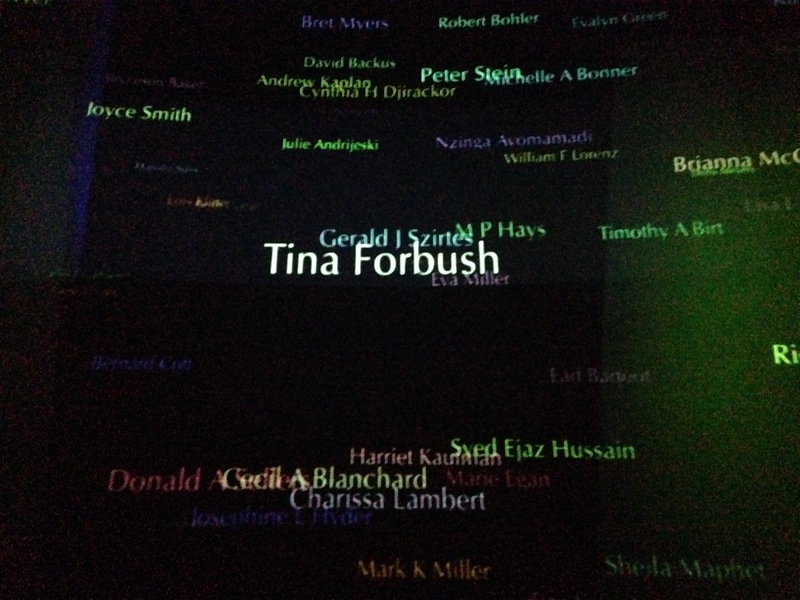 The SPLC also has a small but excellent museum, where we both signed the Wall of Tolerance, pledging to fight injustice and hatred whenever possible (sorry Prescott’s name is hard to read in the second photo; the purple didn’t come out so well in camera shots). 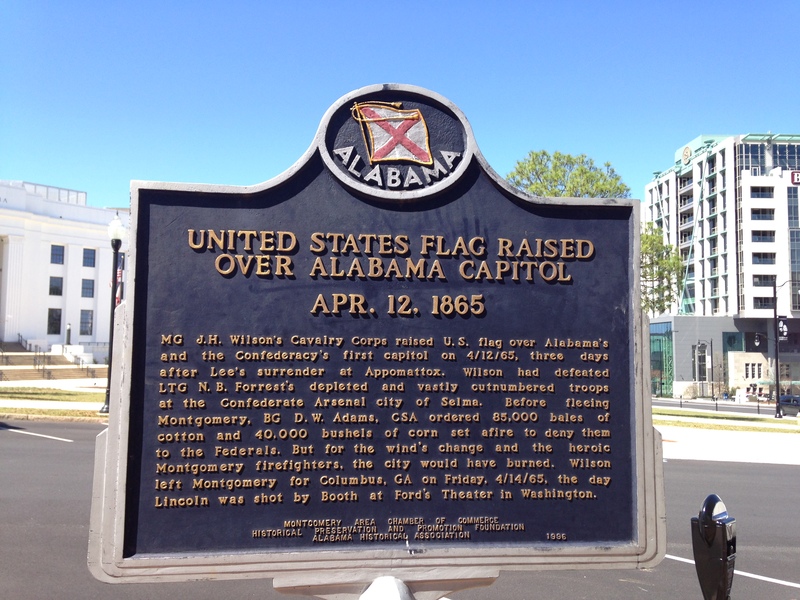 Montgomery has its share of emotionally moving sites, too. Here are the statehouse steps from which Martin Luther King, Jr. addressed 25,000 people after the march on Montgomery. 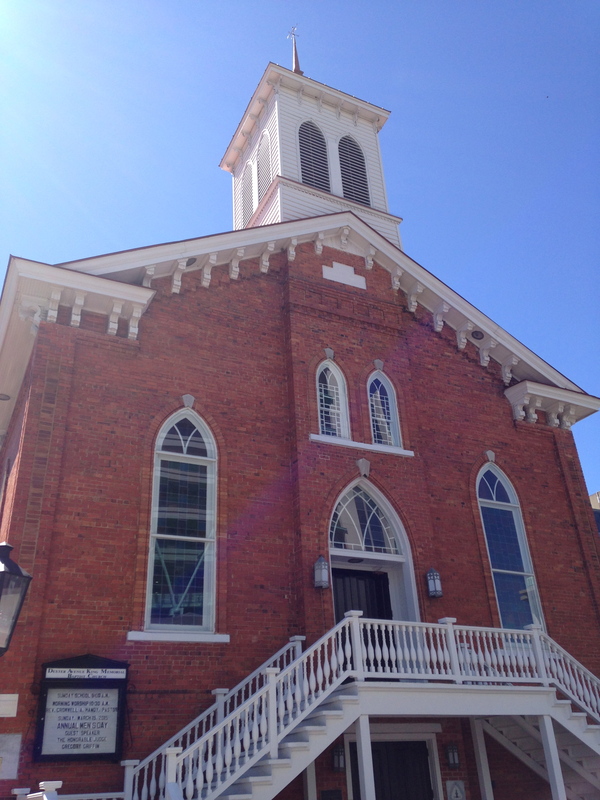 And here’s the church where he started preaching and became the leader of the Montgomery Improvement Association. 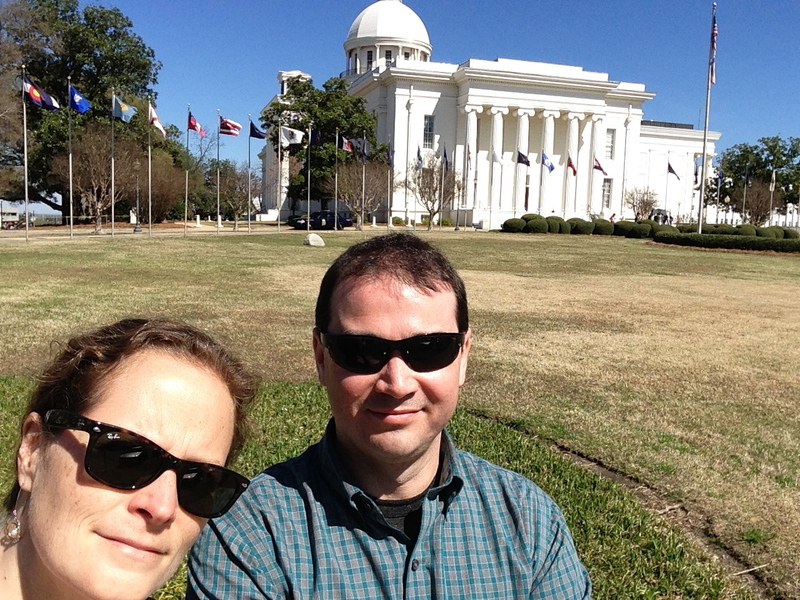 We finished up our walk along Dexter Avenue, drove past the Rosa Parks Museum (which did not come highly recommended), and made our way to lunch at Central in a tiny, cute section of Montgomery that seems to have gentrified. 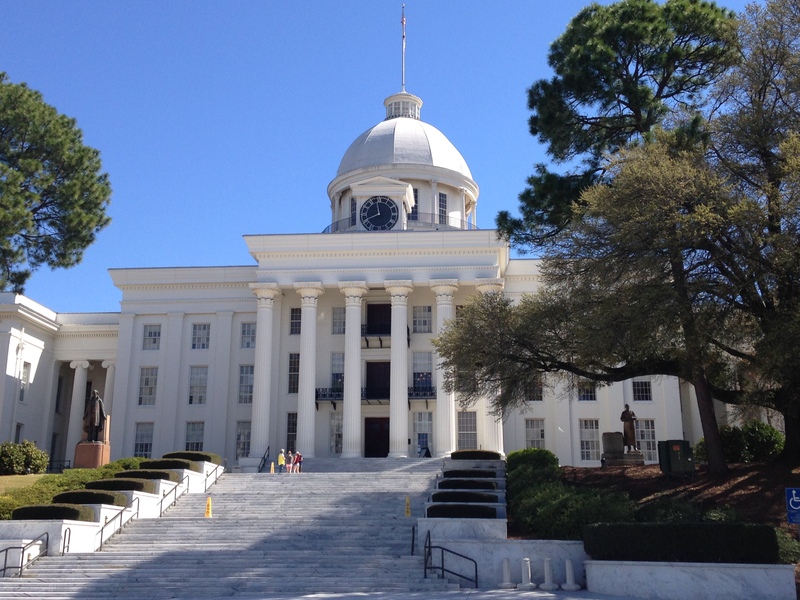 Aside from this part of town, Montgomery seemed largely sterile and uninteresting — lots of big, blocky government buildings and not much else. It’s disconcerting to move back and forth from immersing oneself in difficult history to contending with present day realities. We would find ourselves saying, “oh, there’s the AA baseball field of the Montgomery Biscuits,” or “wow, this fish taco is amazing,” and “is this kale or broccoli rabe on our pizza?” Then those things would all seem trivial — and yet very much a part of our world. I felt like we had an entire day filled with odd transitions like this. 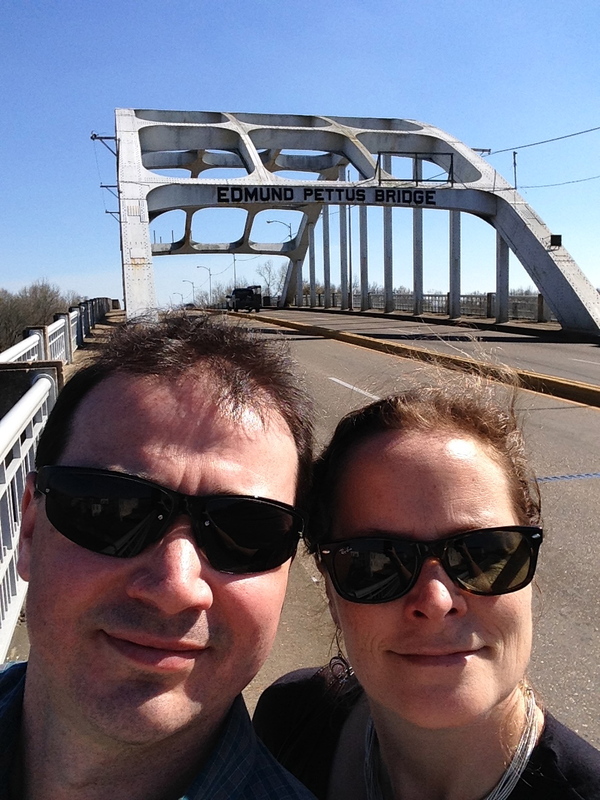 Our next piece in the day’s journey was the drive from Montgomery to Selma. For this drive, we followed — in reverse — the path along Route 80 that the marchers took 50 years ago. It’s a fairly flat, mostly farmland, occasionally marshy route, with surprisingly little of interest along the way. We did stop at a great interpretive center run by the National Park Service about midway through. Still, even with that infusion of video and thoughtful reflection, it’s difficult to drive this route and really feel what it might have been like to be a marcher on this road in 1965. We tried, but it’s hard. It’s easier to feel more like you’re in the depths of the Civil Rights Movement in Selma, in part because it looks like Selma has changed precious little in 50 years. It looks run down and sort of sad. We started out at the Brown Chapel AME Church, which is set in the middle of a federal housing project built in the early 1950s. This church was the staging area for all three of the marches in Selma in March 1965 (Bloody Sunday, Turnback Tuesday, and the final March to Montgomery), and the housing projects you see in the top picture were homes to many of the original marchers (and safe havens for those running away from the police at various times). 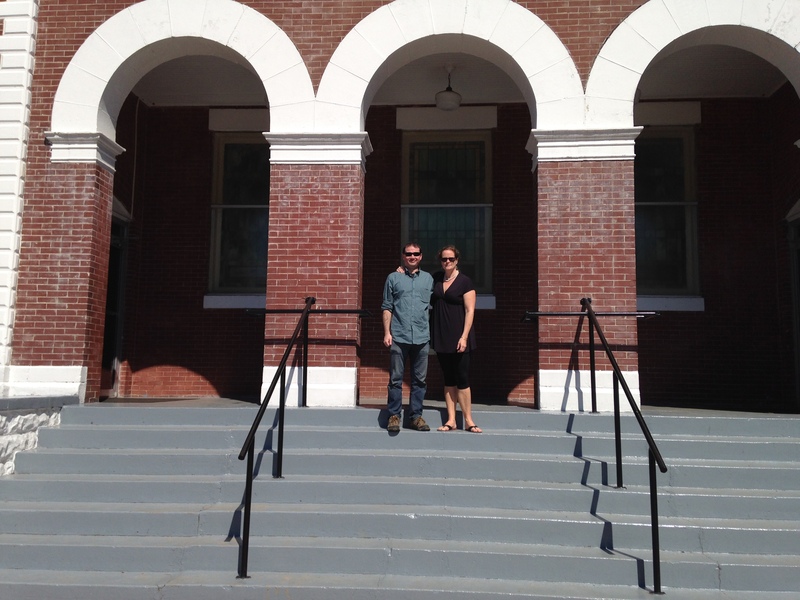 We walked along Selma’s streets, past the jail where King was housed after his arrest in Selma, past the SCLC/SNCC voting rights headquarters, through a tiny National Park Service interpretive center (where we saw some fabulous footage of interviews with various people who were at the march in ’65), and to the Edmund Pettus Bridge. 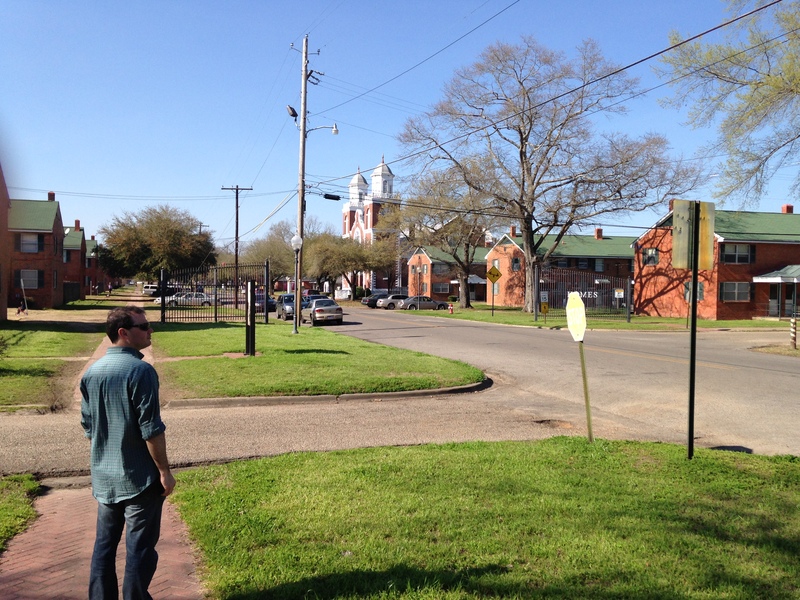 This is the site where marchers were viciously beaten by Alabama state troopers and county posse men on Bloody Sunday, and where the marchers on Turnback Tuesday knelt to pray three days later. It now looks fairly tranquil, but walking over it packs quite an emotional punch. Below is the view that the marchers would have seen when they were forced back on Bloody Sunday. Just to the left of the bridge in the distance is the Dallas County Courthouse, where so many of these same people were repeatedly refused the right to vote. 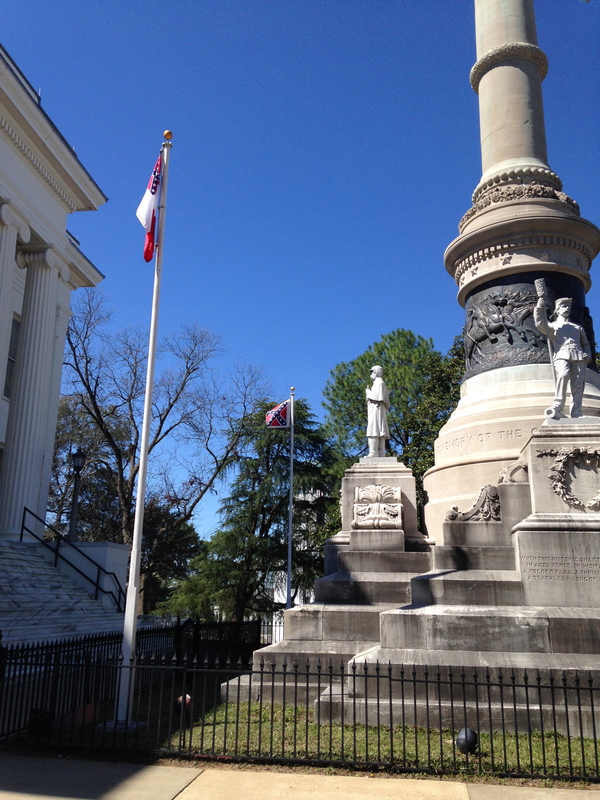 After a brief stop at a remarkably underwhelming memorial, we walked back to our car and took an hour’s worth of back roads to get ourselves to the highway to Birmingham. The southern 2/3 of this is a beautiful drive, first through Talledega National Forest and then through rolling hills and farmland. Again, I found it hard to imagine the kind of fear and trepidation with which Wendy and other civil rights workers would have driven these same roads in the 1960s, though it was much on my mind.